Printed circuit boards are important to prototyping electronic circuit design and create finished electronic products. The components are connected to the PCB with the help of soldering. A neat and fine soldering ensures safe and proper connection and placement of components on PCB. Apart from commercial and manufacturing oriented PCB fabrication, manual soldering is a technical skill needed to develop a PCB for DIY projects and small scale production. 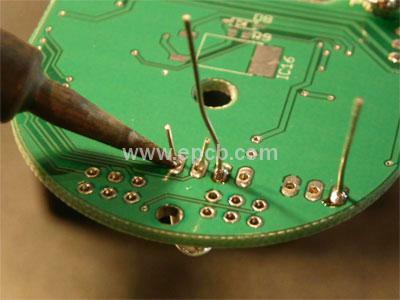 Excellent PCB soldering seldom has common mistakes, such as disturbed joint, cold joint, over heat or PCB damaged joint, insufficient wetting of pin, surface or pad joint, untrimmed leads of components, bridge between surfaces and lifted pads. All these common problems can be overcome to make a neat and well-soldered PCB. A good solder joint has a very smooth surface that glows like a star, with the solder joint at a 45-degree angle with component legs. Disturbed joint has porous contact with PCB and it can loosen upon touch. Disturbed joint can easily be healed with the help of putting a neat solder iron tip raised to moderate temperature on it. Cold joints do not pinch component legs and PCB surface. These joints can be adjusted by reheating the solder on the surface. Overheating the counter part of the cold joint leaves damage marks on the PCB surface. These marks can be removed by scratching the surface and fixing by re-soldering. If surface of PCB or leg of component or pad is not given enough contact time with solder iron tip, this can result in insufficient wetting joint. This can be modified by re-heating to get an excellent soldering joint. A well heated surface with proper contact time of solder wire with soldering iron and PCB surface can help avoid over-solder or soldering too much on PCB board. The tips above help to solder well joints of components on printed circuit boards when small number PCB boards are needed, and you want to manually solder components on the printed circuit board for rapid prototyping. You may do a good job following the tips in your next project.